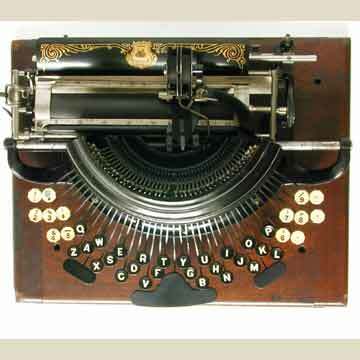 The Franklin 7 was the first Franklin typewriter that actually showed a model number. It also featured a portrait of Benjamin Franklin on the paper table. The Franklin 7 was identical to the Franklin 8. The only difference being that the Franklin 7 was built for the US market and the Franklin 8 for the foreign market. It had two extra keys for special characters. An interesting aspect of the Franklin is the positioning of the ribbon spools, slightly right of center above the platen (pic 6). The Franklin was sold until around 1909.